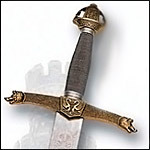 The popular attractively priced line of "El Cid" swords from Spain has been extended to include five new models, representing several leaders and legends from medieval Europe: The outlaw hero Robin Hood, the valiant knight Ivanhoe, the legendary strongman Hercules, the Viking legend Odin and the Emperor Charlemagne. All blades are crafted in polished stainless steel and hilts are finished in bronze. Crafted by Armaduras Medievales of Toledo to C.A.S. specifications, the Black Knight and the Black Baron combine Armaduras' standards of finish with the ability to withstand the rigors of re-enactment for which "Armaduras" swords are renowned. The blades are fully-tempered high carbon spring steel, superbly complemented by gleaming black-chromed hilts. Black oil-finished leather scabbards are standard.